PACIFIC OCEAN (NNS) -- Arleigh Burke-class guided-missile destroyer USS Halsey (DDG 97) participated in a show of force strait transit exercise off the coast of southern California, Aug. 6, as part of Halsey's composite training unit exercise (COMPTUEX). SAN DIEGO - Arleigh Burke-class guided-missile destroyer USS Halsey (DDG 97) is scheduled to be open for public visits at Broadway Pier, April 29 and 30. WATERS NEAR GUAM –Cooks from the Valley organization volunteers grilled steaks for Sailors aboard the Arleigh-Burke class guided-missile destroyer USS Halsey (DDG 97). SOUTH CHINA SEA – The Arleigh Burke-class guided missile destroyer USS Halsey (DDG 97) celebrated the U.S. Navy’s 239th Birthday. PHILIPPINE SEA - Maintaining a physically fit lifestyle for Sailors onboard a deployed U.S. Navy warship can be challenging. For Sailors aboard the Arleigh Burke-class guided-missile destroyer USS Halsey (DDG 97), participation in the command-wide “Sail Into Shape” weight management challenge program encourages wholesome eating, healthy lifestyle choices and solid exercising habits. 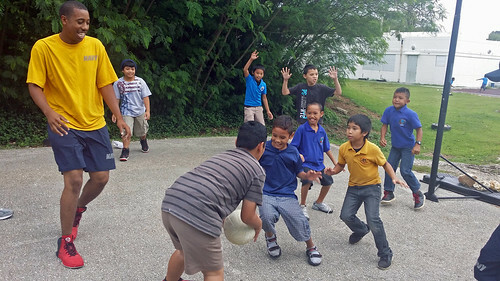 AGANA, Guam - Sailors from Arleigh Burke-class guided missile destroyer USS Halsey (DDG 97) came together to build relationships through goodwill interaction with three community relations (COMREL) projects during their recent port visit in Guam. INARAJAN, Guam (NNS) -- Sailors from Arleigh Burke-class guided missile destroyer USS Halsey (DDG 97) volunteered at Inarajan Elementary School in Inarajan, Guam. 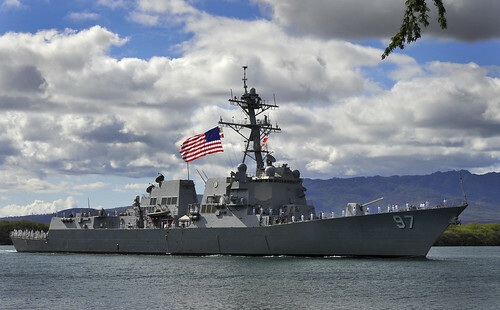 PEARL HARBOR, Hawaii – Guided-missile destroyer USS Halsey (DDG 97) will depart Joint Base Pearl Harbor-Hickam on Monday, July 7, for a deployment to U.S. 7th Fleet area of operations. 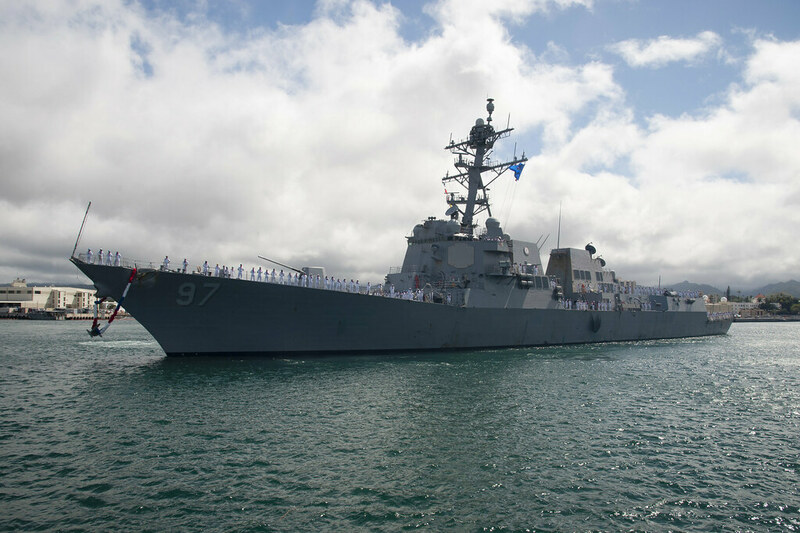 JOINT BASE PEARL HARBOR-HICKAM, Hawaii - The Arleigh Burke-class guided-missile destroyer USS Halsey (DDG 97) is scheduled to return Feb. 5 from a seven-month deployment to the Western Pacific. 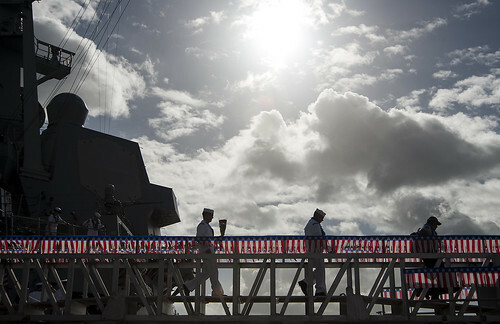 PACIFIC OCEAN - Guided-missile destroyer USS Halsey (DDG 97) is slated to return to its homeport of Joint Base Pearl Harbor-Hickam from a six-day underway. PEARL HARBOR - More than 2,500 guests, including Pearl Harbor survivors and World War II veterans gathered at the Pacific National Monument's Pearl Harbor Visitor Center to commemorate the 72nd anniversary of the attack. 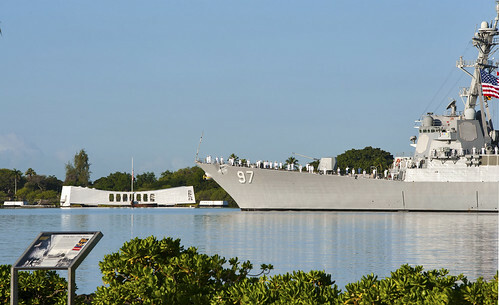 PEARL HARBOR - Traditionally in America, Thanksgiving kicks off the holiday season. For many, one of the best parts of the season is the chance to feast, to share and to, well, be thankful. 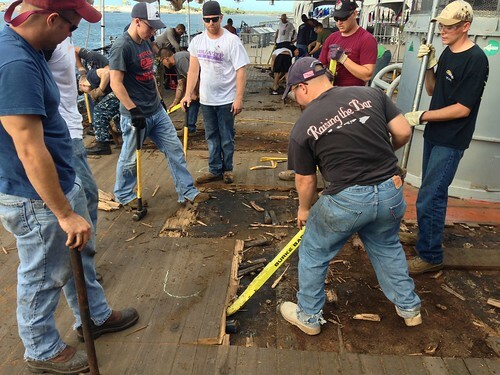 PEARL HARBOR - Sailors from the guided missile destroyer USS Halsey (DDG 97) joined Sailors from other Joint Base Pearl Harbor-Hickam waterfront commands Sep. 18 to help replace the wooden decks aboard the historic Missouri Battleship Museum moored in Pearl Harbor. HONOLULU (NNS) -- Sailors from various Navy commands in Hawaii gave rousing "shout outs" to friends and family members during a message recording at Cox Media Studio of ESPN 1420am radio in Honolulu. PEARL HARBOR-HICKAM - The guided-missile destroyer USS Halsey (DDG 97) will arrive at its new homeport of Joint Base Pearl Harbor-Hickam, after a successful "hull swap" with USS Russell (DDG 59) in San Diego in January. SAN DIEGO - The crews of guided-missile destroyers USS Halsey (DDG 97) and USS Russell (DDG 59) finished swapping hulls at Naval Base San Diego. Naval Base San Diego; USS Halsey featured in "The Last Ship"
SAN DIEGO - Production crews completed nearly two weeks of filming for the pilot episode of "The Last Ship", executive produced by Michael Bay, onboard Naval Base San Diego (NBSD) and the Arleigh Burke class guided-missile destroyer USS Halsey (DDG 97). SEATTLE - The 63rd annual Seattle Seafair Fleet Week concluded Aug. 6 when U.S. Navy ships USS New Orleans (LPD 18), USS Bunker Hill (CG 52) and USS Halsey (DDG 97) departed from the Port of Seattle. SEATTLE - The 63rd annual Seattle Seafair Fleet Week kicked off as amphibious transport dock ship USS New Orleans (LPD 18), guided-missile cruiser USS Bunker Hill (CG 52), and guided-missile destroyer USS Halsey (DDG 97) arrived in the Port of Seattle. SAN DIEGO – Devin Hensley, a nine-year-old diagnosed with a Stage IV Wilms’ tumor, received a wish sponsored by the Indiana Children’s Wish Fund of Indianapolis, to spend a day visiting elements of Commander, Naval Surface Force, U.S. Pacific Fleet in San Diego, Calif.
BRISBANE, Australia - Cmdr. Mike Weeldreyer, commanding officer of the guided-missile destroyer USS Halsey (DDG 97), presents a survivor of the Battle of Coral Sea, who served aboard USS Lexington (CV-2) during World War II, with a Halsey command coin. CHENNIA, India - Thirty Sailors aboard guided-missile destroyer USS Halsey (DDG 97) volunteered at Nirmala Sishu Bhavan Orphanage April 9 during the ship's port visit to Chennai. ARABIAN SEA - Sailors assigned to the the guided-missile destroyer USS Halsey (DDG 97) participate in a swim call. VICTORIA, Seychelles - Sailors aboard guided-missile destroyer USS Halsey (DDG 97) enjoyed a port visit in Seychelles, March 2-6. VICTORIA, Seychelles - Sailors aboard guided-missile destroyer USS Halsey (DDG 97) volunteered at the Saint Elizabeth Orphanage for Girls, during a port visit to Victoria, Seychelles, March 4. USS Halsey, At Sea - Retired U.S. Marine Lt. Col. Oliver North, host of the award-winning television show, “War Stories with Oliver North,” visited the guided-missile destroyer USS Halsey (DDG 97), Feb. 25-26. ARABIAN SEA (Feb. 7, 2012) - Sailors simulate fighting a fire during a flight deck recovery drill aboard the guided-missile destroyer USS Halsey (DDG 97). 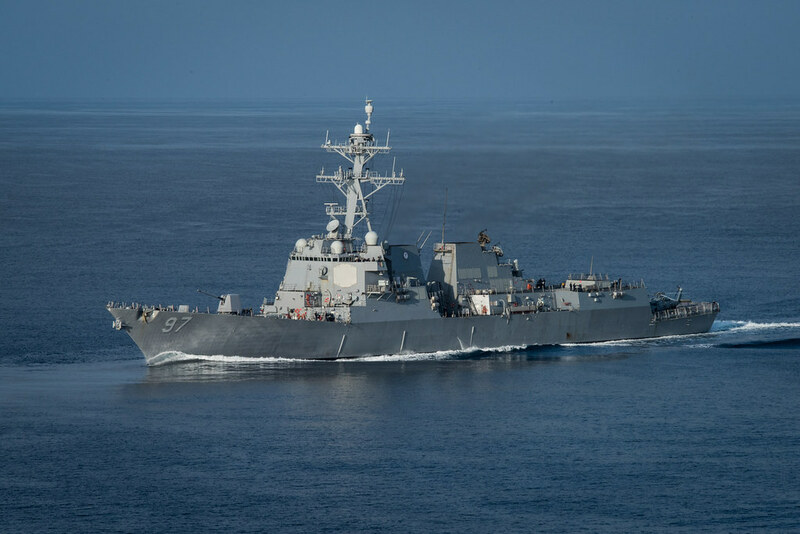 USS HALSEY, At Sea - USS Halsey (DDG 97) responded to a call of distress from M/V Albrouj, a Yemeni dhow that was en route to Somalia from Yemen, while the U.S. ship was conducting helicopter operations in the Gulf of Aden, Jan. 19. USS HALSEY, At sea (NNS) - Sailors aboard guided-missile destroyer USS Halsey (DDG 97) brought in the new year during a celebration on the mess decks while on a Western Pacific deployment Dec. 31. USS HALSEY, At Sea - Sailors aboard guided-missile destroyer USS Halsey (DDG 97) took time off from their Western Pacific deployment for a steel beach picnic, Dec. 18. USS HALSEY, At Sea - Guided-missile destroyer USS Halsey (DDG 97) frocked its newest petty officers during a ceremony in the hangar bay while on a western Pacific deployment, Dec. 8. USS HALSEY, At Sea - Sailors aboard guided-missile destroyer USS Halsey (DDG 97) are staying connected to family with United Through Reading (UTR) while on their western Pacific deployment. PACIFIC OCEAN - Chief Gunner's Mate Jason Mitchell demonstrates proper takedown techniques on Information Systems Technician 2nd Class Hang Chen during combat training aboard the guided-missile destroyer USS Halsey (DDG 97). 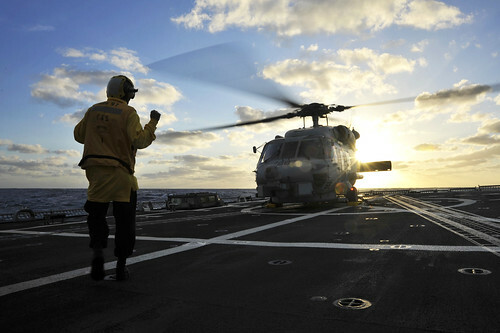 Halsey is underway conducting operations off the coast of Southern California. Ensign Jennifer Rubin fires a 9mm handgun during small arms qualifications aboard the guided-missile destroyer USS Halsey (DDG 97). SAN DIEGO - USS Halsey (DDG 97) returned to San Diego following an independent six-month deployment to the U.S. Central Command (CENTCOM) and Western Pacific areas of responsibility (AOR), March 14. ARABIAN SEA (Dec. 10, 2010) The guided-missile destroyer USS Halsey (DDG 97) takes lead in formation for the Abraham Lincoln Carrier Strike Group and the French navy aircraft carrier Charles De Gaulle (R 91) Strike Group. A Sailor aboard the guided-missile destroyer USS Halsey (DDG 97) speaks to members of Boy Scout Troop 918 about his experience as a boy scout. The Troop, sponsored by Saddleback Church in Orange County, Calif., had a two-day camping trip at Naval Submarine Base Point Loma. 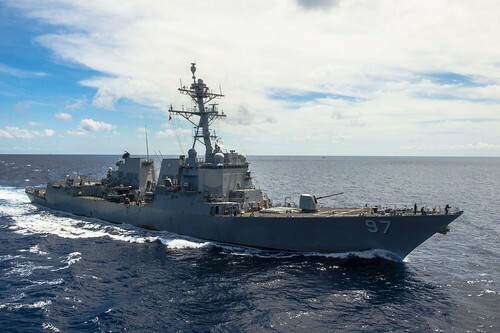 USS HALSEY, At Sea (NNS) -- The guided-missile destroyer USS Halsey (DDG 97) completed an integrated anti-submarine warfare exercise with Strike Group 9 ships May 16 during the Abraham Lincoln Carrier Strike Group training group sail. 100507-N-3929G-001: USS HALSEY, At Sea, (May 7, 2010) USS HALSEY, USS STERETT, USS MOMSEN, and USS SHOUP in formation firing synchronized five inch gunfire and crew served weapons. Halsey is currently preparing for deployment with the Everett-based Abraham Lincoln Strike Group. US Navy photo by Logistics Specialist Second Class Sheryl Gutierrez. 100502-N-3929G-001: VICTORIA, BC, Canada (May 2, 2010) USS HALSEY and USS STERETT Sailors volunteered at the Burnside Gorge Community Association. Halsey is currently preparing for deployment with the Everett-based Abraham Lincoln Strike Group. US Navy photo by Logistics Specialist 2nd Class Sheryl Gutierrez. SAN DIEGO, CALIFORNIA (March 5, 2010) -- The guided-missile destroyer USS Halsey (DDG 97) held a change of command ceremony while pierside, March 5. Commander Matthew J. Harrison relieved Commander Robert E. Beauchamp as Commanding Officer. Sailors aboard the guided missile destroyer USS Halsey (DDG 97) took part in a number of community relations projects during their Aug. 11-17, port visit to Victoria, Seychelles. The guided-missile destroyer USS Halsey (DDG 97) held a change of command ceremony Aug. 17 while at anchor off the coast of Victoria.